Italians (quite naturally) like to tell you how beautiful their country is – a rather annoying habit at the end of one’s year abroad as with every appreciation of one’s friend’s patriotic ode one feels a little worse for not having visited these places. I had in fact already been mulling over the idea of a holiday. 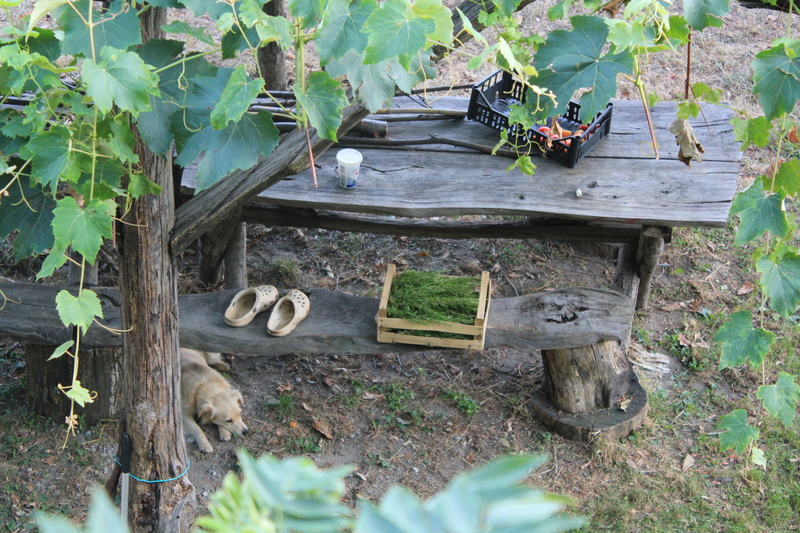 To a Degrowth camp near Lucca, Tuscany – to experience simple living for a bit and meet some Italian authors I admired who would be running workshops. But the camp was costly, so, partially taking heed of my friend’s advice, I opted for a farming experience, this time volunteering on the farm belonging to what I had understood to be a young couple with a young child who ran yoga retreats on their farm which was easily accessible from the train station by bus. Not so! The farmer’s car broke down the day I was supposed to arrive so I went a day later. His car was still not fixed so his bee-keeper friend, the elderly, bearded Raetano collected me from the train station at Chiavari and escorted me into the secluded spot of the farm/’yoga retreat’ half way up a mountain. A bit more remote then I had imagined! (Having read that it was accessible by bus and foot from the train station in half an hour) erm, bit of a generous estimation with the mountain-climb at the end of the trek! Anyway, I thought GREAT, this is just what I need. A bit of piece and quiet and seclusion in my quest for the Degrowth Dream! Raetano’s wife was in the kitchen and offered me a home-made tisana when I arrived. Massimo was a bit hectic – on the phone lots/faffing around. Having safely delivered some of their bees for a change of air, the couple soon left us (yep, just Massimo and I) for their two-hour drive home to somewhere rural in Piedemonte. Soo, I was expecting to be staying with a young couple and their 5 year old daughter, whilst helping out with guests – a yoga group on a retreat there. Although Massimo mentioned in his email that he might be ‘alone’ for a ‘bit’ of the two weeks and would need extra help with running things/looking after his daughter, nothing else in his correspondence led me to believe otherwise. It soon became clear that he had split from his partner and the little girl would be coming for a visit a week later. There was no yoga group, but two elusive Milanese ladies were renting the upstairs of the house. I was like, ok! fine! He seemed normal, and I just thought, well great, this means I’ll have even more time alone to get through the many books I lugged up with me. But I think Massimo was very lonely – well, of course, being so remote, with no nearby neighbours – and required consistent companionship. I didn’t really mind at first. He was interesting. And I was open to the learning experience. We did some meditation and sang some Fabrizio de Andre songs. We cycled down to Chiavari to borrow his friend’s van to pick up some plants from a greenhouse place. We had a good work/friendship relationship. He spilled his romantic history onto me and wallowed a bit in the mess of it all. But I was still like, cool, interesting, fine…I was sympathetic but distant (I felt). But by the third evening I started to receive signals that he was interested in being more than just friends. Not feeling comfortable, I made an excuse to leave. I felt terrible departing, having promised to help, but I decided to follow my gut instinct. And there were other factors involved…it becoming apparent he really wouldn’t be giving me free time, not that I would be ‘working’ exactly, but companioning him/housesitting, so I wouldn’t really have been able to travel round the Cinque Terre during my “time off”. If there had been a real community there I would have remained. But, as it was, I didn’t feel safe. Or comfortable: having being forced into such an intimate relationship with an unhappy stranger.